At 1130 on April 14, 1945, Lieutenant Junior Grade Takahiro Kumakura took off from Kanoya Air Base as pilot in a Zero fighter carrying a 250-kg bomb and died in a special (suicide) attack east of Tokunoshima at the age of 22. He was a member of the Kamikaze Special Attack Corps 2nd Tsukuba Squadron. After his death in a special attack, he received a promotion to Lieutenant Commander. 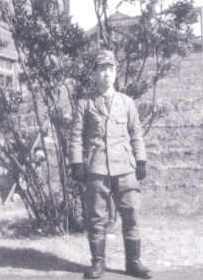 He was from Tochigi Prefecture, attended Senshū University in Tōkyō, and was a member of the 13th Class of the Navy's Flight Reserve Students (Hikō Yobi Gakusei). 0630, line-up, finally it is the sortie. Waiting for the weather report to come, we are standing by at the airfield. Everyone took photos. With the Tsukuba Unit, this is our farewell to this world. I must participate in tomorrow's general attack. At 0940, we took off with everyone seeing us off. The 21 planes that took off circled for a while in the skies above, passed through the skies above Tōkyō, and headed straight toward Kanoya Air Base. Along the way, the weather did not become good. When we got to Kyūshū, we flew straddling the east coast. I saw Tomitaka Airfield, and in a while we were above Kasanohara and then reached the skies over Kanoya. We flew around once and landed on the runway. The dust clouds were tremendous. All planes landed safely, and we gathered together. Sunset was at 6:30. In the darkness we departed for classrooms here at an elementary school. The aircraft maintenance workers are doing maintenance through the night. They are preparing for tomorrow's sortie. We slept with the clothes that we had on. All of our heads lined up, dreaming of tomorrow's sortie and an instant sinking. When I went out to wash up before sleeping, I met Lieutenant Hayashi. In this strange place for the first time in a while I told tales of long ago. It brought back memories. Narita also was there. I slept well. I washed up in the current of a creek. After finishing breakfast, from 0800 Commander Nakajima talked to the Special Attack Corps members. From 0900, with the communications officer we made arrangements regarding radio telegraph codes and contact steps. 10:00, with a short time I am writing hastily a final letter. I enclosed two or three double-petalled cherry blossoms and put in place my bags. I now have no regrets. After a few hours I will go and make a splendid taiatari (body-crashing) attack. There is no formal last letter, but I feel calm with only writing a while. 11:00, lunch, immediately gathered at airfield command post. They designated groups of kutai (typically four aircraft) with various colored mufflers such as white, red, yellow, purple, and blue, and the young warriors gathered together. They wore hachimaki (headbands) with a red circle over their flight caps, and the hachimaki trailed down their backs. I feel we are like the Byakko (White Tiger) Unit  from long ago. 12:00, 10th Air Fleet Commander held naming ceremony. As early as 1:00, 1st Kutai headed toward Okinawa with a 250-kg bomb hanging from wing. They raised a dust storm when they started. They made a sortie that will lead to a watery grave at the bottom of the sea for all of the thousand and several hundred ships including transports, cruisers, battleships, and destroyers. Ah. My own kutai number also finally came. The departing aircraft were sent off by the commanding officer, Commander Nakajima. They pulled the aircraft out from the bunkers, and he commanded all of them to line up on the runway. In the instant when I was trying to take off, a bomb somehow dropped from where it was held. Unfortunately, they pulled the aircraft off the runway and tried to again hang a bomb, but they were not able to do so as the hanging mechanism was completely damaged. Regrettably when they looked back, it was discovered that the fourth plane also had dropped its bomb and was stopped. Evening was approaching, and I had a feeling the attack would be in the evening. When the second and third aircraft were about ready to take off, they came running to the takeoff point, and the second and third aircraft seemed to see their concerned faces. They signaled them with flags to go. The pilots acknowledged the instruction and took off. When they returned to the aircraft and looked at the bomb, the maintenance workers worked hard to fix it, but in the end they had to replace the mechanism that held the bomb. Ah, I wonder what it could have been. I have fallen behind! I felt bitter and resisted weeping. I reported to the commanding officer. He indicated that if the repairs could be completed in 30 minutes then we could depart, but if the departures were stopped then we would be moved to the next date. When I looked to see whether I was alone, Ensign Ichinoseki on the fourth aircraft also was crying on the grass. The majority of the aircraft had their bombs dropped, quickly did the repairs in time, and took off . Although I tried to not cry, I could not control the dropping tears, what a disappointment! Three of us cried before the buntai commander. We truly had a failure! Since the sun set and it became dark, we returned again to the elementary school, but I did not want to mix with others. I was dizzy inside my head. But two subordinates were before me, and I could not be discouraged. Regrettably I showed a distressed face, and I said that certainly I would participate in the next attack. I vowed that my battle results would be more than twice as much. I was not able to sleep. I did not need a meal either. I am full of bitterness. I did not listen at all to the words of the head officer. The words of the buntai commander also were no good. I do not understand this feeling. Ah, why do I have bad luck? About this time everyone has turned the surface of the Okinawa Sea to crimson red, and what was floating has been sunk and what was flying has been knocked down. As they are laughing they are waiting in the other world for me to go. Looking at my watch, I think that it is about the time that the last planes have attacked. About now the skies around Okinawa must have changed to deep red and the seas must be afire. The cold has come again. A strong wind struck, and a Suisei dive bomber had to drop its extra fuel tank to gain control. The plane had made a sortie in the early morning and was searching for the enemy. The skies to the east are clear. The southwest has low dark clouds hanging down, but the skies above are clear. They said that we would make a sortie today, and since early morning we have been standing by. There is no longer free time to write this diary. Now I will stop writing. I wonder by whose hands it will be delivered, but I want to request that my warmest regards be given to my Father and Mother. During today's sortie, I certainly believe that I will get a souvenir. I'll enjoy in the other world the souvenir of a large aircraft carrier. Seeing my extremely rough writing is surprising to me. A search plane has taken off again overhead. Our sortie probably will be soon. Underneath my flight cap I am wearing a tightly-wrapped hachimaki (headband) with a red circle. I certainly will accomplish an instant sinking. Basking in the morning sun, my plane is on standby. When the order comes down, our fighters will take off and fight in a few seconds. Look, Japan's morning breaks! With an extraordinary feat I truly will make a hit. Go, young eagles! Burn with the spirit of hissatsu hitchū (certain-death, sure-hit)! April 12, 10 a.m. Farewell. I pray for everyone's happiness. The diary entries come from Hakuō Izokukai (1952, 194-8). The biographical information in the first paragraph comes from Hakuō Izokukai (1952, 194), Katabami (2014, 84), and Osuo (2005, 198). 1. The Byakko Unit consisted of over 300 teenage samurai of Aizu (part of current Fukushima Prefecture) who fought in the Boshin War (1868-9). The government army defeated the Byakko Unit, but they committed seppuku (ritualistic suicide by disembowelment) when they realized that they would lose and be captured as war prisoners. 2. On April 6, 1945, 17 Zero fighters each carrying a 250-kg bomb from the Kamikaze Special Attack Corps 1st Tsukuba Squadron took off from Kanoya Air Base and made special attacks off Okinawa (Osuo 2005, 197-8). On April 14, 1945, the remaining three Zero fighters piloted by Lieutenant Junior Grade Takahiro Kumakura, Ensign Sadao Ichinoseki, and Flight Petty Officer Toshio Arai in the 2nd Tsukuba Squadron took off from Kanoya Air Base and made special attacks east of Tokunoshima.